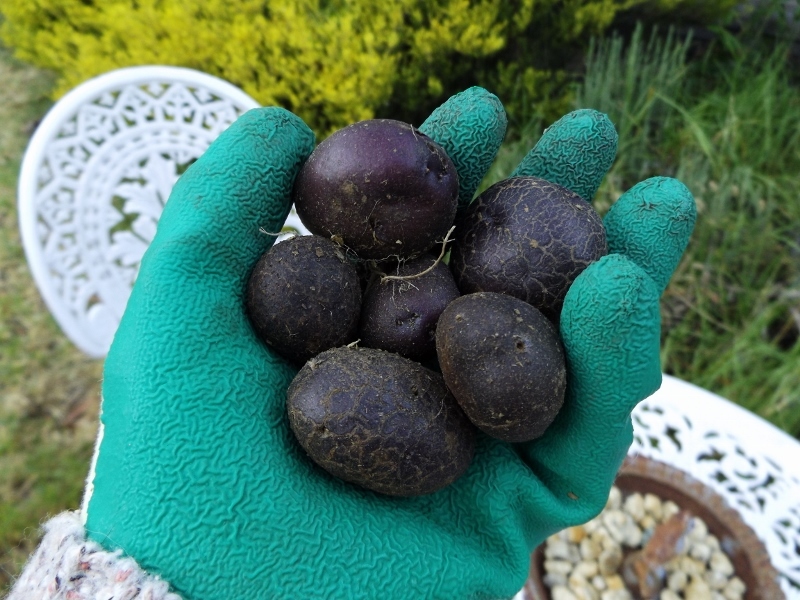 These potatoes make my hand look big. The results were a failure. Six little potatoes. 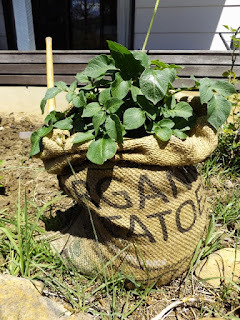 The plants growing in the ground did well but not those in the bag. I watered them and the substrate they were growing in was good and fertile but from what I have been reading, it might be the heat that was working against me. I would not be surprised, it has been desperately hot. So I will probably give the experiment another try when the conditions are not so extreme or find a cooler spot. That is the good thing about growing in the bags, they can be placed anywhere you like. 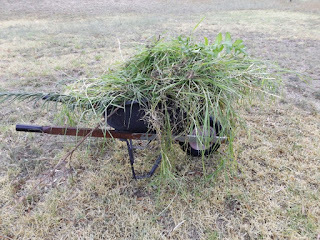 What the heat and dry weather doesn't affect is the weeds. They can thrive in any conditions it seems. 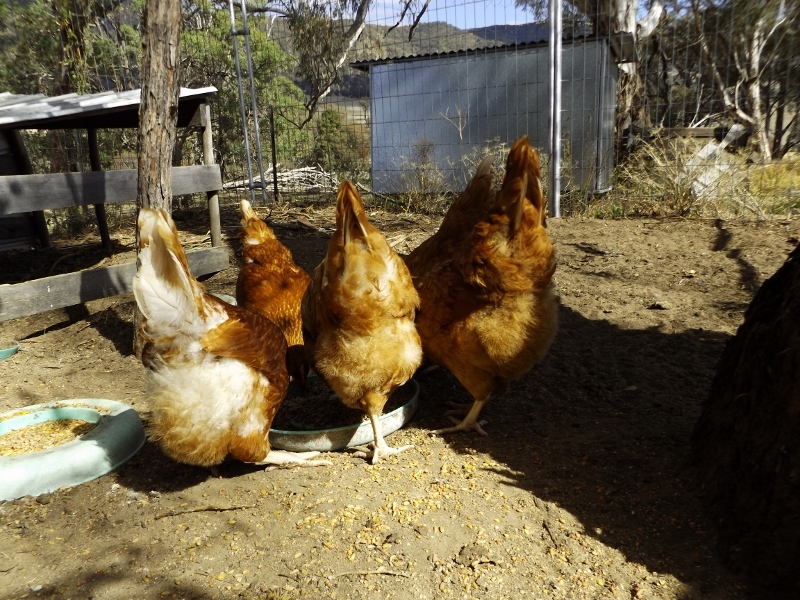 The chooks took good care of this lot and they've also been scratching in the newly weeded patch in the front garden. 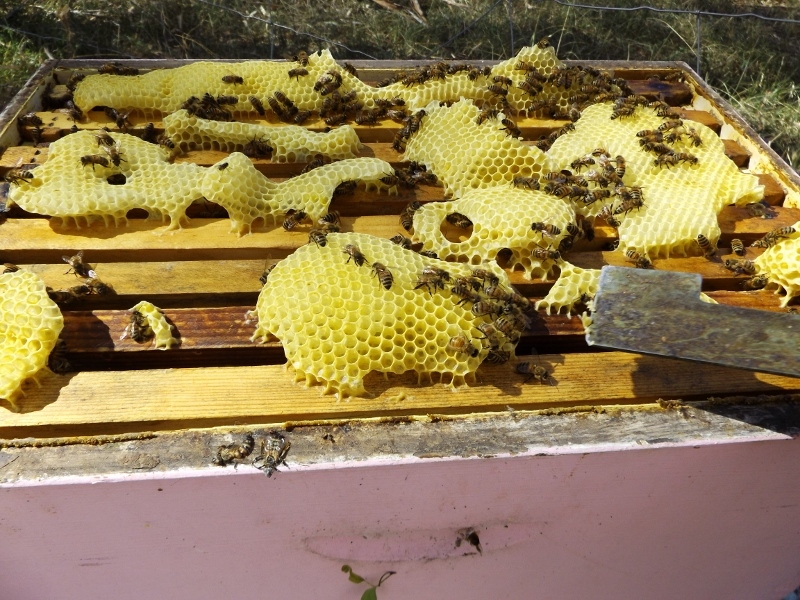 The bees are busy. There are eucalypts in flower and they are making the most of the nectar. I hardly see them in the vegetable garden when there are gum trees in bloom but thankfully I did notice a few in the pumpkin flowers this morning. Hopefully that translates to pumpkins down the track a little. 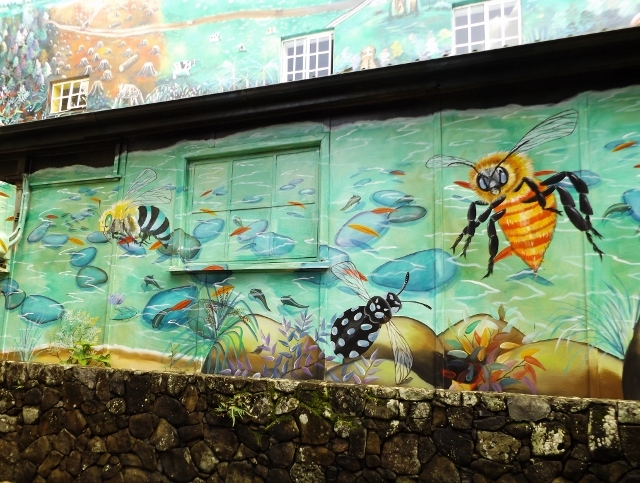 Thankfully the blue-banded bees love the vegetable garden and are pollinating the basil, chillies and tomatoes. ANyway, day 5 of Month of Letters and I have some writing to do. I'm surprised by how quickly February has come around especially with the days on end of extreme heat which at the time seemed to drag on and on. But here we are and another Friday Night with Friends has been and gone. Thanks to Cheryll for hosting. 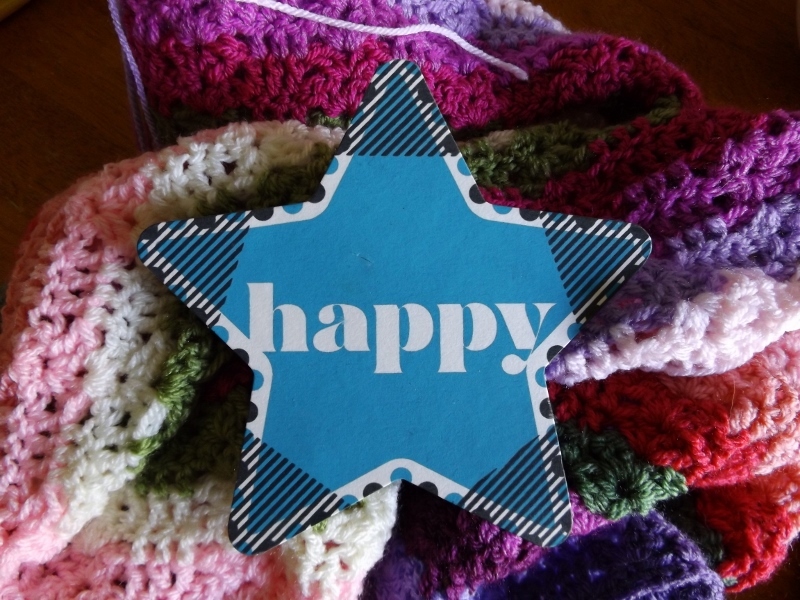 As promised, I crocheted. 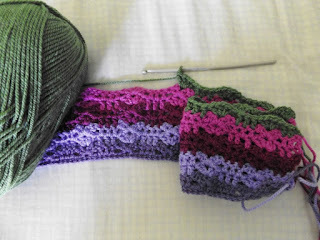 My Sweet Pea crochet along is coming along. It should be double this size by now but, it's not. It will be. I'm enjoying the process very much and mostly I get a few strips done each evening, sitting outside when the sun has lost its bite and there are no chores left to do for the day. Along with the virtual company of the other crafters taking part, I had a real life craft companion this month. Grace has been cross stitching. It's a good distraction when she needs to take a break from studying for exams which she has been doing this week. Also as promised, I made some envelopes. This one is from a colouring book. I do not like to colour-in. Never have. So I fold the pages into envelopes and I think they look ok The paper is usually nice and sturdy too which is good. Now I just have to fill all those new envelopes with letters. The Month of Letters starts tomorrow. That's a whole month of writing and mailing each day the mail runs. I try to average out to having one mail item per day for February regardless of the days on which I actually post it. I'm nowhere near a post box so I just send when I go to town. 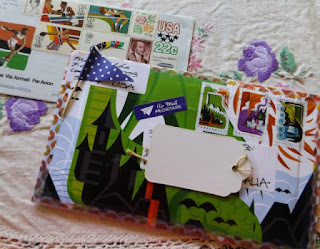 Surprisingly, I don't have many letters in my reply pile so I will probably post some random mail to friends or family all over. Time to get outdoors for chores before the heat. 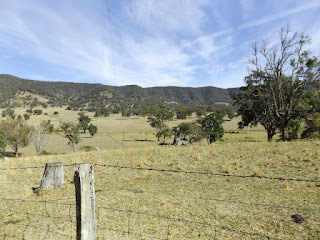 I just got to thinking that since I had been away from blogging for almost a year a catch-up even if it is a brief one might be a good idea. I feel as if there is not much to say and so much at the same time. Unfortunately the defining feature of the past year has been the drought. It really has been dry but it is what it is. My animals have enough to eat and drink and now I have another tank with water just for the garden so no complaining. I'm grateful for having enough. I did give up on the vegetable garden in early 2018 as at that time there simply was not enough water but good to go now. There is some sadness from last year. 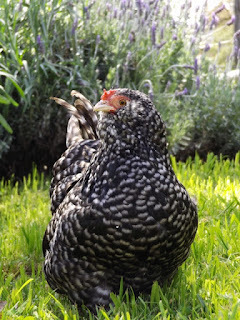 My precious little pet hen passed away in March. 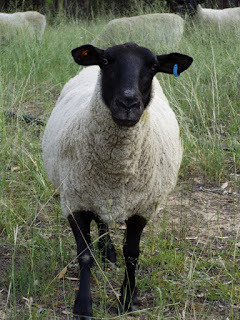 I miss her when I am weeding as she was always following me around and chatting. I think 10 years is not a bad inning for a chicken. There were a few short trips but no big travel (that is for later in the year and next year perhaps). Coffs Harbour for a university trip for Grace (any excuse for a holiday for us), Byron Bay, Sydney and Hervey Bay. So not too far from home but a chance to unwind and see and experience new and/or different places. We had been chicken-less for a while and decided to rescue a few hens. So now we have five laying hens who are as ungrateful as can be and demand tidbits and are always hungry for whatever you might have. They didn't know how to scratch or were frightened of the greens I gave them when they first arrived but not so now. They know it all. I'm glad. On the creative front, I honestly did not make much other than a mess (which I am very good at). 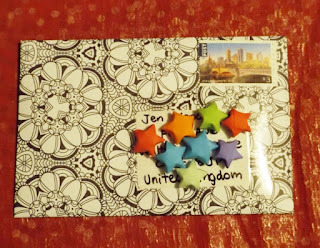 I kept up with my mail and tried to be creative in that with decorated envelopes and such. I also have my junk journal which I mostly just stick in bits and pieces that I want to keep. It's a bit of a mish-mash with pages dedicated to the teabag packages from tea that friends send me, postage stamps from my mail,stickers . Anything really. A routine I did establish in 2018 was bread making. I started my sourdough baking in 2017 but it was not our daily bread, rather a treat now and then. These days, I am baking a loaf every two days. It is habit now to feed the starter and to bake. 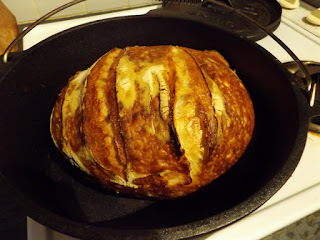 I've just taken today's bread from the oven. I like that every loaf is a little different and it is very much affected by the ambient conditions. I'm not as keen on loaves made when there is humidity in the air for instance. Not much of that at the moment. Other things. Hope is in her last year of school as I mentioned the other day. She is keen to be done with school of course. Grace will be finished her degree in October but what her next step is up in the air at the moment. Tim is working hard and his new roster gives him more time to work hard here too (even if we don't). I stop here for now. Don't want to use up all my words in one post. 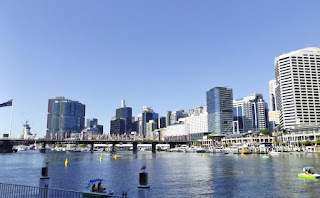 I have been off on a too short weekend trip to Sydney. That was last weekend and I am just catching up here now. Holiday mode and a heat wave are my reasons for not checking in sooner. Tim went back to work today after a month of leave and Hope will be back at school at the end of the month. Then it is back to routine. School has been a backbone of my routine since 1999 so it will be strange next year not to have that as Hope finishes school in October and she is my baby. Anyway, onto the holiday. We had some great family time. Visiting with our son and his love. Got to see their new flat all decked out how they want it. Last time we saw it, it was a work site. Looks good now. Had a wonderful evening with my sister, brother in law and my two nephews. They visited us last month so our turn this time. Darling Harbour was the backdrop and it didn't disappoint. I would rather it was less crowded but with the draw of fireworks, everyone wants to be there. It had been too long since I had been to the beach so I booked an overnight stopover at Forster for the trip home. I'm glad I did. The water was wonderful. With the heatwave we've been having this week, I would love to be back there in the surf. The hot weather has been draining. Up extra early to get out before the sun is over the hill and before too many flies are about to bother me. Then out of the sun and heat as much as possible until evening. It feels a little nicer out today and there is a cool breeze blowing for now. 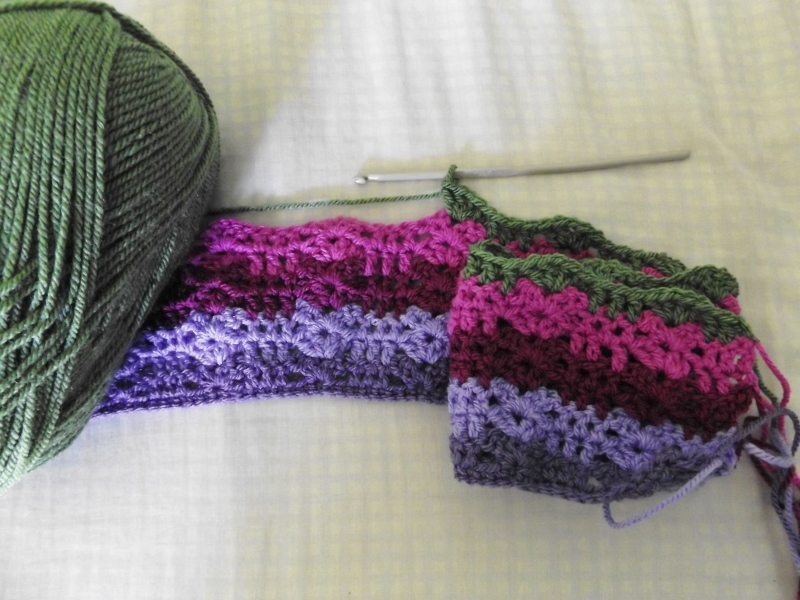 I have been crocheting which does sound like a crazy thing to do in the heat but I don't want to get behind with the crochet along. 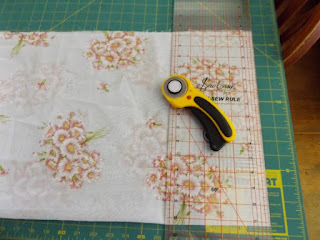 I'm enjoying it immensely and today I will weave in some ends which although I won't enjoy that task at all, I will be glad when I get to the end and don't have loose ends to tuck in. Plenty of letter writing happening too. I took a break from that the first two weeks of the year so I have a few replies to write. Keeps me out of mischief. It is school and work holidays and it is lovely. The days have a real gentle rhythm. I am really enjoying my time in the morning when it is just me, a cup of tea and some quiet meditation. I would like to sleep in but it is not in my make up, never has been. The weekend was hot but there has been a slight reprieve the last two day. Mid-thirties instead of 39℃ which doesn't sound like much at all really. On sunny, hot Sunday I got out the sewing machine and some vintage sheer fabric my great-uncle gave me. I made 8 produce bags of various sizes so when the garden isn't feeding us then I'll be prepared. I'm hoping to give them a trial run soon and then I can take some pictures of them in action. 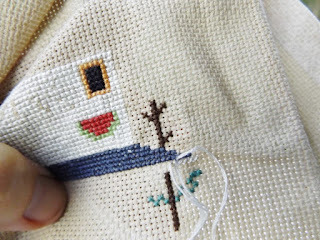 I've also been stitching a few stitches each day on my cross stitch until the evening light outside gets too low. Yarns are sorted for the big crochet project so it can start in earnest now. 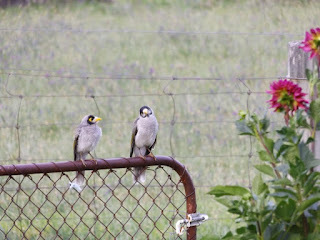 When I did my morning gardening yesterday I disturbed some sort of conversation between these two noisy miners. They were probably plotting how best to steal something from the garden. I had company while I gardened. 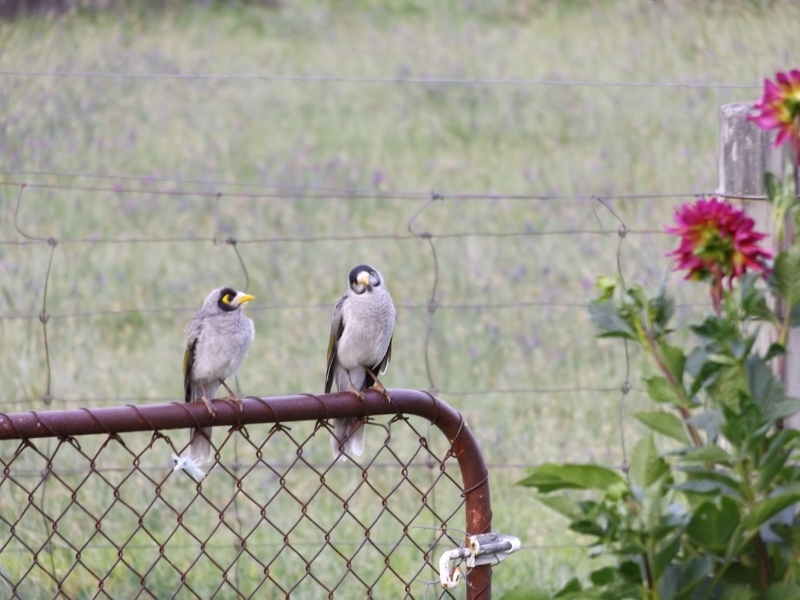 Happily said company was on the other side of the fence. The sheep always get a few bits and pieces when I'm working. I have a Chou Moellier kale growing which is a particular favourite along with dahlia flowers/leaves and any tomatoes I can spare. 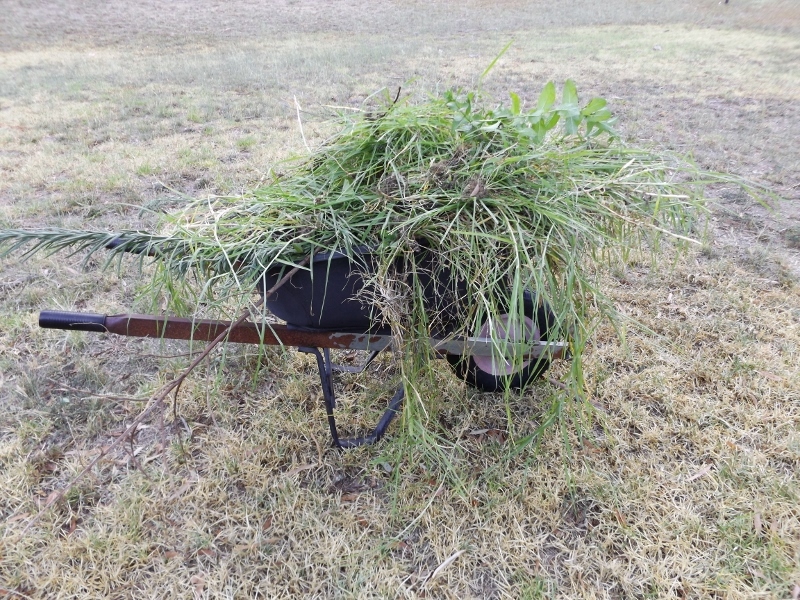 The chickens get the weeds and they are happy for that too. I had a lovely surprise today. Amy from Love Made my Home popped back up in my reading list. It looks like 2019 might be the year for getting back to blogging across the board. I know I am glad to be back. 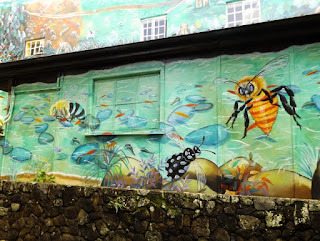 Amy's blog has always been a friendly place and a good read too. Her Instagram feed is beautiful too. Well, I have finished my tea and have work to do. Hope you have an interesting day. I did join in with Cheryll's Friday Night with Friends albeit briefly. Friday was very hot 39℃ and not conducive to crafting or much of anything really. I had to water the vegetable garden late in the day too to avoid the heat after missing my opportunity in the morning. I did some stitches on my long term work in progress that I will valiantly try to finish this year. It may require a new set of reading glasses but I'm determined. When that got too much, I made some envelopes out of last year's calendars. 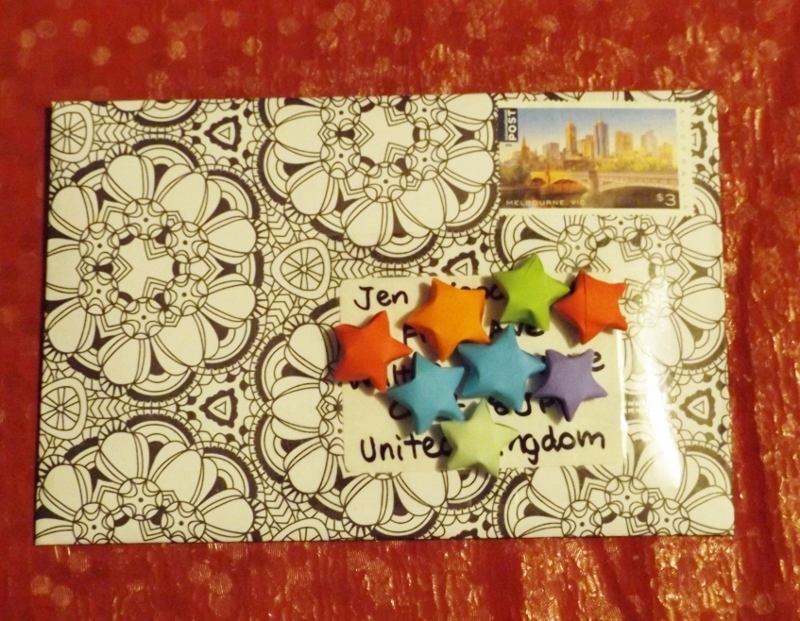 I use those for my sending penpal letters. 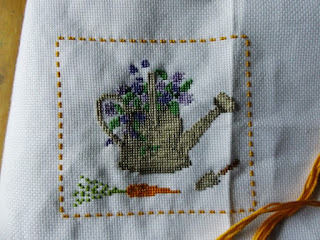 Not much done really but very nice to sit and stitch knowing I'm in the company of friends. It has been too long since I have done that. 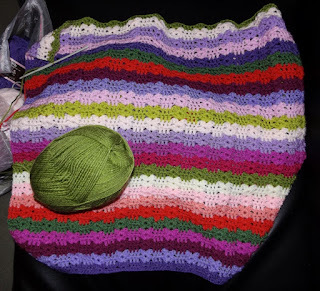 I have my pattern now for the Sweet Pea crochet along so I know what I'll be occupied with over the next while craft-wise.